Knowledge@Wharton: What are the biggest challenges for business leaders to be the most effective in this digital culture? Stephanie Woerner: I think “culture” is one great word that describes what has to happen within companies. They have to develop new ways of working, really taking evidence into account when making decisions. Another is really figuring out how to integrate the business. What customers are expecting is a seamless experience, and you really can’t deliver that in the long term without using technology to integrate silos so that you’re able to share across the business. Externally, boundaries are more porous and leaders have to think about how they’re going to use partners to add things that their company doesn’t have. Knowledge@Wharton: You’ve framed this book around six questions for companies and business leaders to consider. What are those questions? Woerner: The first is, how strong is the digital threat or opportunity to your business model? [It’s helpful to figure out] where do you have competitors coming in, where are startups [and] what percentage of your revenues are under threat. The second is, which business model is best for your enterprise’s future? In our book, we talk about the two dimensions that we have found most enterprises are looking to change. The third is, what’s your key competitive advantage — are you going to focus on content, experience or platform? The fourth is really thinking about technologies, especially digital technologies, and how are you going to use mobile and the internet of things to connect and learn? Then we talk a little bit about the crucial capabilities to reinvent the enterprise. We have identified eight of them. Finally, do you have the leadership at all levels to make the transformation happen? Knowledge@Wharton: You give an example involving banks becoming places to help people buy a home, not just to come in to get a mortgage. What happened to make businesses think more about the customer’s needs? Woerner: We couldn’t do it until we had some of these technologies in place, where you could start to think about creating an integrated experience that also is integrated across channels, and is integrated across your products and services. USAA (United Services Automobile Association) was one of the early companies in thinking about these life events. They had their members coming to them and saying, “I need to change my auto insurance.” USAA realized they could help them buy the car, do the financing and do the insurance, so they created that as an experience. It was so popular that other companies started to think about how do you take these products that you have as a company and turn them into a solution for your customer? Knowledge@Wharton: The digital component of a business is so important because of our connectivity, right? 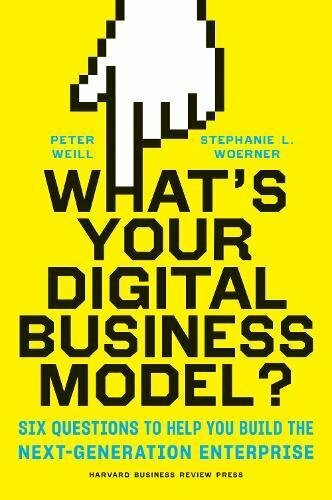 Woerner: That’s right, but I think we need to be careful in just suggesting that a company add a digital business unit. If you just layer a digital business unit onto the enterprise without fundamentally changing the organization, you’re not going to succeed. There is some very complicated, deep background work that’s got to be done to pull off these integrated products and services. Knowledge@Wharton: How do you change or incorporate a digital culture? There are a lot of different skills that are needed that may not exist in a company currently. Woerner: What you’re talking about is this culture that’s going to change in terms of cross-functional collaboration. There’s going to be a lot more of it. When you’re talking about skills that you’re trying to hire for, you’re going to have to have people who understand what digital can do for your company. If you really look at the ways of working, we’re seeing a lot more test-and-learn, a lot more experimentation. But you can’t just experiment. You actually have to know how to take those experiments and then scale them up. As we’re doing research on digital, we’re seeing that work is changing, becoming more flexible, becoming more evidence-based. We’re also seeing that leadership has to change because they can’t just go with intuition. They’ve got to be willing to look at the data that all of their operations and their people are coming up with. It’s a lot more about communication. And there’s a really big piece about coaching because if you’re going to iterate and learn and experiment, you have to be able to give feedback on a continuous basis so that both people and the organization can succeed. Knowledge@Wharton: Some businesses have become ecosystems, which suggests the increased merger activity that we’re seeing. Do you expect that trend to continue? Will we see more companies try to become an ecosystem, especially when they’re relating to their customers? Woerner: Absolutely. We did not talk about it in this book, but in some research that we just did, we see a fair amount of consolidation at the ecosystem level, and I think we’re going to continue to see some more. I don’t know where we’re going to end up. Being an ecosystem is really, really hard. You have to have a platform. You have to have the people. You have to have the partnerships in place. You have to know a lot about your customers. And that’s very difficult to pull off. We’re seeing it in banking, where banks are trying to figure out how they offer these products and services — these integrated solutions — for their customers. We’re talking to manufacturing companies that are trying to figure out what they would have to add to become an ecosystem, so I think we’re going to see more consolidation. Retail is interesting because Amazon has got its fingers in a lot of different types of retail. It’s hard to see what happens there. But certainly in the companies that we’re talking to, they’re all making an ecosystem play. In fact, we advise companies to think about if you can’t be an ecosystem driver for the whole industry, can you be an ecosystem for your best customers? That will at least get you some experimentation. You’ll get some learning, then you can take those learnings and apply them to your current business model. Knowledge@Wharton: You mentioned retail, which is a sector where the customer relationship has become more important than ever. Technology gives consumers many different choices, so loyalty isn’t something they hold on to as much as they did in the past. Woerner: Search changes everything. Consumers, both B2B and B2C, can easily find different options just through search. You’re right in saying that the customer is at the focal point of a lot of these interactions, and the technologies that have been put into place make it easier. You know through social media what your friends are thinking. You can be connected through mobile and the internet of things. It’s nascent, but there’s a lot of opportunity there for different kinds of companies using sensors to create a relationship. Knowledge@Wharton: Businesses are always looking for an advantage over their rivals. How has digital changed that? Woerner: Often, they were looking for efficiencies and cutting costs, and now they’re thinking as much about creating that relationship with the customer and learning more about their customer. You’re thinking about partnerships and changing your business design so that you’re not just a value chain but more of an ecosystem. I think that digital makes those easier. It also increases your potential for being seen globally. Those are some of the things that we’re seeing. Knowledge@Wharton: You focused in the book on health insurance company Aetna. How has Aetna been able to seize the opportunities and differentiate itself from the competition? Woerner: We thought Aetna was fascinating because they took a long-term approach to changing their business. When they started, they were what we call a supplier — that’s one of our four digital business models. They were selling their products through intermediaries to employers and had no connection with the end-customer. Over time, they did a couple of things. One, they made a series of strategic acquisitions. One of them that we had so much fun talking about in the book was iTriage, which was a mobile app that anybody could download. You could put your symptoms in, and they could help you figure out what was wrong. They could learn a lot about what customers were thinking about when they would actually tap into using their insurance. At the same time, Aetna could intervene, so they ended up with far fewer emergency room visits. One of the other things that they did is looked at their APIs (application program interface). What could they service-enable that could be used for innovation internally in creating those integrated products and services, and how could they open up to more partners? They didn’t open up their APIs externally to everyone, but they created a series of partnerships so that they could begin to offer complimentary products and services to their members that they didn’t have before. They really were moving themselves more to an ecosystem. What’s going to happen with the CVS merger/acquisition, we’re not sure. We’re hoping that we can get in and talk to them again once it’s complete. But I think it’s fascinating how you take this big old insurance company that remakes themselves to move more into an ecosystem, driver-type of model. Knowledge@Wharton: What about the future of digital with respect to policymaking? Legislation is behind the technology right now, but it is moving to the top of the agenda. Woerner: Policy is not my area, but I think that you’re right. Congress may be slow, but look at what Europe is doing with the GDPR (General Data Protection Regulation). Every company that we’ve talked to is concerned about GDPR because any company that has to deal with Europe is going to be affected by those regulations. Europe is starting to set some rules into place that many companies are trying to figure out how they’re going to follow. One of my colleagues does research on creepiness. Is collecting all of this data creepy? How are you using it? Do you serve up advertising that makes your customer think, “What do they know about me?” There are going to be some changes around data use, I think. But I don’t know if Congress is going to be the one to do it, or if it’s going to come from outside the country.